Is there a charge for the initial consultation with the attorney? There is no charge for the initial consultation, no matter how long it takes. At the consultation we will interview you regarding the facts of your case and advise you if you have a meritorious claim. How do I know if I have a case and/or whether I really need a personal injury attorney? Not every claim requires an attorney. 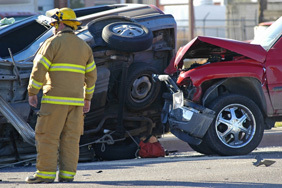 There are many accidents that cause injuries that can be resolved without an attorney. Whether or not you need an attorney is largely determined by the nature and extent of your injuries and complexity of the facts of the accident itself. For example, if you have been rear-ended and have a modest amount of medical bills, you may not need an attorney to resolve your case with the adverse insurance company. In these simple matters, we routinely assist, free of charge, accident victims on how to settle their case without an attorney. At the initial free consultation we will give you an opinion on whether we believe you require legal representation. How do I choose an attorney? What should I look for when selecting an attorney? All one has to do is flip through the yellow pages to realize that there are many attorneys to choose from for your particular case. Many TV and yellow page personal injury attorneys run their offices based on the quantity of cases they have, not the quality of services they offer. Many personal injury attorneys who advertise do not even have a real office in Santa Cruz County. The only time you ever see an attorney is when he initially signs you up. Thereafter, you’re assigned a paralegal to handle your case. At Scruggs, Spini & Fulton, we are a local firm whose members have been practicing law in Santa Cruz County for a combined total of over seventy-five years. We are Santa Cruz County’s most experienced and largest personal injury law firm. We obtain most of our cases by word of mouth, which means that we provide excellent service and obtain good results for our clients. What do I have to do once I hire an attorney? Once you have hired an attorney your main focus should be to recover from the injuries you suffered in the accident. This means you should diligently follow through with your medical treatment and follow the advice of your medical providers. Once you have completed your treatment your attorney will gather all of the medical records, bills, and other documentation of your losses and draft a demand letter to the insurance company to attempt to settle your claim. Many cases can be settled out of court at this juncture. If an agreement cannot be reached with the insurance company at this particular point, then litigation may be necessary. How long will it take to resolve my case and will I have to go to trial? Many cases can be resolved within a year following the date of the accident. If the insurance company does not make an adequate offer within that one year period, then it might be necessary to file a lawsuit. Approximately 3% of cases fail to settle and, thus, go to trial. Our law firm makes every effort to resolve a case without litigation, but we will never recommend that you settle a case out of court for less than what we believe you are entitled to receive under the law. We will litigate your case and even take it to trial if an insurance company is making an unreasonable offer. We have a reputation for having the resources and skills necessary to litigate a case if necessary. There are many questions that an accident victim typically has and we invite you to set up an initial free consultation to get all of your particular questions answered by one of our attorneys.